port, or section of a port, exempt from customs regulations (see tariff). Goods may be landed at a free port for storage and handling, and they may even be processed into manufactured goods. , Port. Pôrto, city (1991 pop. 310,600), capital of Porto dist. and Douro Litoral, NW Portugal, near the mouth of the Douro River. It is Portugal's second largest city, after Lisbon, and an important Atlantic port. Its outer harbor is at Leixões. ..... Click the link for more information. ], fortified wine made in Portugal from grapes grown in the Douro valley; Portuguese law allows only this wine to be called port. Various grapes are blended by the growers, and brandy is added before fermentation is complete. In the spring the casks are brought to Oporto and Villa Nova, where the wines are blended and stored. Vintage port is wine of an exceptional year, kept in cask for two or three years, then matured in bottles—much of it for 25 years. Ruby port, generally a blend of wines of different vintages, is stored in wood and bottled before it loses its clear, red color. Tawny port remains longer in the cask, losing some color and alcohol. Crusted port is vintage or ruby port kept in bottles until it has formed a crustlike sediment. So-called white port is a sweet, amber-colored port matured in wood. Port is sometimes artificially colored with caramelized wine or berry juice. in optics, the actual aperture (iris), or the optical image of such an aperture, that restricts the field of view of an optical system to the greatest extent. If a field stop is located in front of a lens system, it is the input port of the system and its image is the output port of the system. A field stop located behind the system is the output port; in this case its image, which is located in the object space, is the input port. 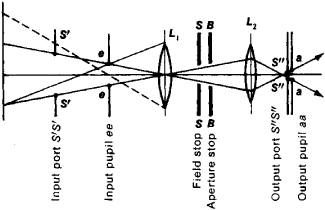 When the field stop is located inside a lens system, its image produced by the preceding part of the system forms the input port, and the image given by the subsequent part of the system is the output port (see Figure 1). If a port coincides with a field stop, the field of view of the system is sharply restricted. This is usually the case in photographic objectives, where the rims of the first or last lens and their images serve as a port; in the eyepieces of telescopes; and in microscopes (the field stop is located in the rear focal plane of the eyepiece). Figure 1. The restriction of a real beam of rays in an optical system by a field stop SS is equivalent to the restriction of the input beam by an imaginary aperture, the input port S’S’, which is located in front of the system (in the object space) and is the image of SS formed by the part of the system preceding it; similarly, the output port S”S” is the image of SS formed by the subsequent part of the system (located in the image space). The output and input pupils of the system ee and aa are the corresponding images of the aperture stop BB. The rays from the outer points of the object (one of them is shown by the dotted line) could pass through the input pupil but are “cut off” by the input port, which thereby restricts the field of view of the system. a portion of the shore of an ocean, sea, lake, reservoir, or river and the adjacent water area, naturally or artificially protected against wave action and equipped for mooring and servicing ships, performing loading and unloading operations, and the like. A distinction is made between seaports, which serve maritime shipping, and river ports, which are on internal waterways. Brief historical sketch. In remote antiquity vessels were moored at places with natural protection against wave action, such as bays, gulfs, river mouths or coasts protected by islands. As trade and navigation developed, it became necessary to build docks and protective structures, thus marking the beginning of port building. The earliest known seaports were Mesara on the island of Crete (3400 B.C.) and two large ports at the cities of Sidon and Tyre on the Mediterranean Sea. During the period of the Roman Empire, ports were built on the islands of Sicily and Sardinia. Carthage had extensive ports with outer and inner harbors. One of the largest Roman ports was the port of Ostia, built at the mouth of the Tiber River. In the Middle Ages the development of port building was furthered by the great geographical discoveries, the expansion of trade and navigation, and the concentration of large amounts of cargo at ports on the seacoasts. Large ports were established in the Netherlands and Spain and later in England. Some of the first ports in what is now the USSR appeared in the 11th and 12th centuries at the sites of modern Tallinn and Riga; these ports were used for trade with the countries of Western Europe. Under Peter I, a number of large seaports were established: Taganrog, Petrovsk (today Makhachkala), St. Petersburg (now Leningrad, at the mouth of the Neva River), Kronshtadt (on Kotlin Island in the Gulf of Finland), and Petropavlovsk (on Kamchatka). In Russia as in other countries, however, significant development of port building began only in the early 19th century, in connection with the appearance of steamships; the construction of larger ships, with greater cargo capacity and draft; and the use of dredging machines to create artificially deepened water areas and approaches. The building of railroads facilitated delivery of cargo to ports, thus contributing to their development. General characteristics. The basic elements of a port are the water area and the land area. The water area usually includes the water approaches to the port, the roadstead and inner basins. The water approaches may be natural (part of the sea or river) or artificial (man-made access channels that connect the port with natural depths). The roadstead is a section of the port protected from strong waves where ships may ride at anchor waiting for authorization to approach the docks or leave the port. When the port does not have deepwater docks, transshipping operations are also carried out in the roadstead, using auxiliary shallow-draft vesssels—lighters and barges. The inner basins, sometimes called inner harbors, which are contiguous with the land area, are used for docking; it is here that the primary and some auxiliary cargo operations are carried out. The navigation lane to the port is marked with signs that provide information on the navigational conditions. The land area of the port includes access routes to the port, including railroad lines, roads, and transport pipelines. It also includes the quay part, which extends to the wharves and is occupied by the quay rail sidings and roads, loading devices and machinery, warehouses and areas for short-term storage of cargo, and passenger terminals. The rear part of the land area is usually occupied by in-port railroads and vehicle roads (including those for urban use), warehouses for long-term storage of cargo auxiliary port enterprises, and service and administrative buildings. The hydraulic structures of a port include protective structures, such as moles and breakwaters; wharf structures, such as piers and quays; and ship-hoisting and repair structures, such as slips, slipways and docks. Lighthouses and navigational information signs set within the water area are other hydraulic structures required by ports. Basic port equipment includes loading devices and machinery that works intermittently, such as caterpillar, portal, gantry, and bridge cranes and car dumpers, and devices that operate continuously, such as portable and permanent conveyors, pneumatic and hydraulic devices, and pumping stations. Among other facilities required by ports are equipment for bunkering (refueling ships), power plants, lighting and communications systems, and firefighting devices. In-port transport includes railroad lines (usually normal gauge), trucks, and special nonrail transport, including self-propelled cars, loaders, and straddle carriers. In-port water transport is provided by an auxiliary service fleet—primarily barges pulled by tugboats. The chief technical characteristics of a port are depth of moorage areas, length of wharfage and elevation of the part’s land area. The depth at the moorage areas is calculated from the lowest navigable level of the water, which is determined by the projected drafts of the ships and the reserve depth necessary beneath the keels. At modern seaports, the depth at the wharves is 10–15 m for dry-cargo ships and 15–20 m for tankers. The length of wharfage determines the number of ships that can be docked and processed at one time. The number of wharves is defined separately for each cargo category. In addition to the wharves necessary for cargo and passenger operations, the port is provided with auxiliary wharves for refueling, mooring the auxiliary service fleet, and repairing ships. The elevation of the port’s land area above sea level is selected so that the port is not flooded when the water is high, and optimal conditions are provided for cargo and other operations. The elevation of the quay part is usually constant, facilitating railroad transport. The port is designed with due regard for the relief and meteorological, hydrological, and other local conditions; designers must take into account the plan of the adjacent city. Thus, for example, seaports must not cut the city off from the sea. At the same time, it is essential that the city leave part of the shore area free for port expansion. The passenger part of the port is usually located near the center of the city, since there must be convenient access for urban transport to the sea (or river) terminal. Ships may be moored along the shore (at quays), along the moles, at piers, which protrude into the water area, and along inner shore basins. Mooring arrangements must ensure both convenient approach and mooring for ships and the possibility of rail and motor vehicle transport to the wharves. The basic transport and economic characteristics of a port are judged by cargo turnover, cargo capacity, and traffic. The cargo turnover (the chief index) is the total amount of cargo (in tons) that passes through the port from land to water, and vice versa, in the course of a year. The cargo capacity of a port is the largest amount of cargo that the port can handle in the course of a year with the port’s given technical equipment and specific schedule of cargo shipping, assuming the port will make use of the latest technology for loading operations. Traffic indicates the number of ships that visit the port during a given period (year, month, or day). Classification. Seaports are subdivided primarily into civilian (commercial, fishing) ports and military ports. Commercial ports usually serve as transshipment points for cargoes being exported or imported by sea. They are also used for cargoes being shipped between the ports of a single country (coastal shipping, or cabotage). Among commercial ports a distinction is made between ports that perform a variety of cargo operations—most large international ports, including Leningrad, Vladivostok, London, Marseille, and New York, are in this class—and specialized ports designed primarily for operations with one category of cargo, which determines the nature of all port work— for example, coal at the port of Cardiff, timber in Arkhangel’sk and oil in Abadan. Passenger ports where cargo operations are of secondary importance—for example, Yalta, Sochi, and the French port of Calais—may also be considered specialized ports. Sea stations, which supply passing ships with fuel, fresh water, and provisions, are a special kind of seaport. Fishing ports, such as Kaliningrad or Murmansk, serve as bases for fishing fleets. In addition to refrigerated warehouses, they often have fish-processing enterprises. Refuge ports are roadsteads in which coastal shipping vessels, trawlers, industrial schooners, and motorboats may ride at anchor or tie up to special buoys behind natural or man-made protective features during storms. Refuge ports usually have ship-repair shops and ship-hoisting devices to render assistance to ships that have been damaged. Military ports are used as bases for squadrons of naval ships and are usually part of a naval base. Seaports are subdivided according to their location into estuarial, lagoon, coastal, and inland ports. Estuarial ports, the most common type, are built at the mouths of waterways that extend deep into the interior of a country and carry large amounts of cargo. The largest ports in the world—Rotterdam, London, New York, Leningrad, Arkhangel’sk, and Hamburg— are situated at the mouths of rivers. A characteristic feature of such ports is the placement of marginal wharves along the river banks at some distance from the sea, which makes the erection of protective structures unnecessary. Lagoon ports are built on coastal lakes (lagoons) that are separated from the sea by natural sandbars and connected to the sea by canals—for example, the port of Il’ichevsk near Odessa and the Iranian port of Pahlavi. Coastal ports are built directly on the coast—for example, the ports of Marseille and Odessa—and usually require the construction of fairly sophisticated protective structures, including moles and breakwaters. When they are situated in bays that have natural protection—for example, in Sevastopol’, Vladivostok, Rio de Janeiro, and San Francisco—protective structures are not ordinarily built. Inland ports are situated at a considerable distance from the sea on downstream (deep-water) sectors of rivers (for example, Kherson, Nikolaev, and Rouen) or on man-made canals cut from the sea into the interior of the country (Manchester, Amsterdam, and Brussels). Ports are subdivided according to importance for transport into world ports (centers of world trade), which are junctions of large cargo flows moving from the ocean to the interior of a continent and vice versa; international ports, which handle trade between different countries; and local ports, which are visited primarily by coastal shipping vessels or serve as refuge for small craft. In the USSR, seaports are subdivided according to cargo turnover and administrative characteristics into three classes. River ports are subdivided according to purpose into general ports, special ports, outports, and refuge ports. General and special ports are designed for transferring cargo from ship to shore, and vice versa. In outports located on reservoirs (in the upper pools of locks), convoys of ships and rafts are reorganized before they enter the lock chamber. These outports are also used to hold ships and rafts moving from a lower pool to an upper one during a storm. Sometimes the same protective structures are used to protect an outport and a general port, for example, Kuibyshev and Tsimliansk. Refuge ports are used to shelter ships and rafts during storms. They are usually in natural bays and, as a rule, do not have wharves. River ports are subdivided by location into ports on natural rivers, which typically have a large fluctuation in water level (up to 15 m and more); ports on navigation canals, in which the water level fluctuates little; and reservoir and lake ports, which are subject to wind-blown waves, usually require the construction of protective structures, and have much in common with seaports. Channel ports on natural rivers usually have two roadsteads in their water area—for arrival and departure—where convoys of vessels being towed are broken up and individual vessels are formed into convoys and from which individual barges are towed to the wharves for loading operations. Roadsteads are usually situated above or below the docks in order to avoid congesting vessel movement in the water area near the docks. Significant fluctuations in water level determine the kind of wharves needed and require the use of wharf boats and, in some cases, spring wharves. Nonchannel ports on natural rivers and ports on navigation canals are located in natural bays, artificial basins, and broadened places in the canals. The principal hydraulic elements and technical characteristics of river ports are the same as for seaports. River ports in the USSR are subdivided according to cargo turnover into five classes. Liakhnitskii, V. E. Proektirovanie portov. Leningrad, 1956. Forty i portovye sooruzheniia, Parts 1–2. Moscow, 1964–67. Ooriunov, B. F., and F. M. Shikhiev. Morskie porty i portovye sooruzheniia. Moscow, 1970. Brium, A. I. Tekhnologicheskoe proektirovanie morskikh portov. Moscow, 1971. (name derived from the Portuguese city of Porto), a strong grape wine made from white, pink, or red grapes by fortifying fermenting grape must or pulp with ethyl alcohol. Ports were first produced in Russia in the 1890’s on the southern coast of the Crimea (Massandra and Magarach). They are made in wine-making regions throughout the Soviet Union (vintage and ordinary types). The alcohol content by volume is 17–19 percent, the sugar content is 5–13 percent, and the titrated acidity is 4–6 g per / (in conversion into tartaric acid). The best ports in the USSR are Livadiia, Massandra, and Farkhad (red), Iuzhnoberezhnyi and Krymskii (red and white), and Surozh, Kardanakhi 14, Aigeshat, Akstafa, Alabashly, and Kizliar (white). The best foreign ports are produced in Portugal (Porto Barros, Porto Coljeita, Porto Dalva). An interface between a communications channel and a unit of computer hardware. An entrance or exit for a network. An opening in a waveguide component, through which energy may be fed or withdrawn, or measurements made. The side of a ship or airplane on the left of a person facing forward. An opening in a bass-reflex enclosure for a loudspeaker, designed and positioned to improve bass response. An opening in a vessel to provide access for passengers, cargo handling, discharging water, and so forth. An opening in a research reactor through which objects are inserted for irradiation or from which beams of radiation emerge for experimental use. 2. an aperture, esp one controlled by a valve, by which fluid enters or leaves the cylinder head of an engine, compressor, etc. (1) (noun) A number that identifies applications and services in a TCP/IP network. See TCP/IP port, port 80, well-known port and opening a port. (2) (noun) A physical socket (jack) that accepts a plug. For example, cables are plugged into Ethernet ports, and cables and flash drives are plugged into USB ports. See jack, plugs and sockets, legacy port, port speed and line card. (3) (verb) To translate software to run in a different computer environment. For example, "port the application to Unix" means make the necessary changes in the program's source code so that it can be compiled and run under the Unix operating system. (4) (verb) To switch a telephone number from one telephone carrier to another. See LNP. To protect the steering oar, boats used to moor up with the larboard side by the dock. Showing the larboard side of the figurehead, the drawing is typical of other examples of figurehead designs in its simple, almost naive quality of draughtmanship. about three hours after nightfall, when we were well out at sea, moving along under a taut sail and with the oars pulled in and lashed tight (for the right-blowing wind had made it unnecessary to work them), going along in the gleaming moonlight, we saw a square-rigged ship hard by us, under full sail, bearing a little to the larboard and directly in out path--so close, indeed, that we had to haul down out sail to keep from ramming her, at which they swung hard over to let us pass. We were doing this scene one day when the Renown is setting sail for the West Indies, and he had a line he had to say to me which was something like 'Weather the Lizard, and put your sails to larboard, Mr Hornblower', and I had to say 'Aye Aye. The school board in January approved steps to relocate the proposed elementary school on Larboard Lane to a 25-acre site on Lindero Canyon Road and Reyes Adobe to ease crowding at Lindero Canyon Middle School. We were doing this scene one day when the Renown is setting sail for the West Indies, and he had a line he had to say to me which was something like: 'Weather the Lizard, and put your sails to larboard, Mr Hornblower'. In the convict section, just aft of the main hatch on the starboard side a section was partitioned off as a hospital, and opposite, on the larboard or port side, was a similar section for boys under sixteen years of age to segregate them from the older prisoners. They again went down for a short time, and then came up to the surface under the packet's larboard quarter, the whale appearing first, and the serpent in pursuit .